Ginny needs routine in her life, preferably routine that involves cooking. When her parents both die in a freak carbon monoxide accident on their first trip in years, her schedule is disrupted, to say the least. A panicked episode during the wake convinces her sister Amanda that Ginny can’t possibly stay by herself. Things are going very, very wrong for Ginny, who can’t stand the thought of losing the only home she has ever known, until something strange happens in her kitchen. While cooking from her grandmother’s handwritten recipe, Ginny suddenly realizes that her long-dead grandmother is in the kitchen with her, apparently brought back temporarily by Ginny’s cooking. Rather than being a way for her Ginny to redirect her life, however, bringing back people’s ghosts through her cooking seems to raise more questions for Ginny than it answers. Okay, first of all, I love this cover. Love, adore, etc. I love the way the net hangs like a dress, how the weight of the peppers give it just the slightest hint of femininity. It is simple, but gorgeous. I’m not sure if foodie fiction has just recently come onto my radar, or if it has had a huge uptick in popularity, but there is a lot of it out there, it is a trend I have noticed ever since Erica Bauermeister’s The School of Essential Ingredients, although of course it wasn’t new then, by any means. In so many of these books, food or cooking plays a somewhat magical role, bringing people together, healing broken hearts, or just providing people with a satisfying outlet for life. So even though I was excited for The Kitchen Daughter, I must admit that I was expecting something that was mostly more of the same. Bringing back the ghosts of loved ones by cooking their recipes? Of course, definitely the next logical progression for foodie fiction. Except The Kitchen Daughter was much more than just a ‘food is magic’ rehash, mostly because of the depth McHenry brought to her main character, Ginny. Ginny is undiagnosed, but is likely living with Aspergers. Losing her mother is devastating for Ginny not only because it interrupts her routine, but because her mother is the one who put all of Ginny’s routines in place, and made them all possible. Ginny’s mother sheltered her from the world, so Ginny could avoid being upset. This does position the death of her parents as the perfect catalyst for Ginny’s growth, however, it is perhaps even necessary for any growth to occur. McHenry writes Ginny beautifully, certainly she has personality traits that many would find odd, but she is still wonderfully human and relate-able, she is not an Other with Aspergers. This is something that Ginny must try to make her controlling sister, Amanda, understand, and it is something that she must continually remind herself of as well, with her incredibly moving Book of Normal. 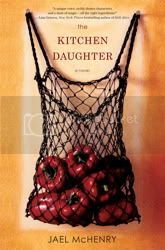 Those who love foodie fiction will love this book – the descriptions of cooking are mouth-watering, and the requisite recipes are included – but if you’re worried that you’ve burnt out on foodie fiction, The Kitchen Daughter still deserves your attention. It is a lovely book with characters who will be just as real as you read McHenry’s words as Ginny’s ghosts were when she cooked from their recipes. I think this book sounds lovely. I had not noticed the femininity of the cover, but you’re absolutely right. I’ll be on the lookout for THE KITCHEN DAUGHTER. I just got this book today…I love foodie books so I can’t wait to attack/read this one…I am so glad you liked it. The cover alone makes me want to read this book. Sounds like a really good novel – thanks for sharing! I love how this one, according to you, went deeper than just mouth-watering fiction. I’ll have to check it out! What a great review. I enjoyed this one as well, but I didn’t love the cooking ghosts portion of the novel. I’m still gathering my thoughts to write my review. I didn’t have a problem with the ghosts, but I can see how that element might not work for everyone. I was thinking the same thoughts about the cover, except as a tank top. Did you ever read Bread Alone? That’s one my favorite foodie fiction books. ..moving this one to the top of the TBR pile. or at least nearer the top. Thank you for posting, I totally agree with you. It i t a enjoyable read. I just finished it today. I will be posting soon my thoughts.